Aerobic respiration is the process in which glucose and oxygen, through the action of enzymes in mitochondria, produce carbon dioxide, water and lots of energy. In this experiment the use of oxygen in the aerobic respiration of peas can be seen in that, in a sealed container, the level of oxygen reduces with time. Mount the oxygen sensor pointing upwards on the beehive shelf. A little BluTack is useful for anchoring it in place securely. Run it's connecting lead through the central hole of the beehive shelf. Fill the trough with water at room temperature to a depth of about 3 cm and place the beehive shelf with the sensor into it. Plug the sensor’s connecting lead into External socket 1 on DrDAQ. Place a tissue handkerchief or piece of cotton wool into thebottom of the 100 ml beaker and place 10 or so peas onto it. Place this beaker in the water alongside the beehive shelf. You may find it useful to anchor it down with BluTack. Now place the 2 litre beaker, upsidedown, over the beehive shelf and 100 ml beaker and into the water so that it seals in the air. A centrally heated and thermostatically controlled room or laboratory should not change much in temperature, probably only of the order of 2–3 °C, assuming that windows are not suddenly opened or lots of bunsen burners lit. Load PicoLog and configure it to collect readings of the oxygen sensor every minute for three days (4320 samples.) This will not in fact be the data set that you will wish to retain - it is to enable you to know when it is useful to start recording for real. Set it to start recording. Refer to the oxygen level regularly over the next two to three days. During that time the peas should start to germinate and respiration will begin, shown by a fall in oxygen level. At this stage stop the recording and discard the data. 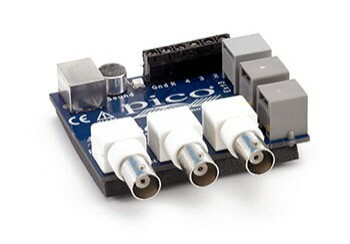 Reconfigure PicoLog to collect readings of the oxygen sensor every minute for two days (2880.) Set it to start recording. When datalogging is compete, display the graph of % oxygen against time. Ideally one would also investigate how the temperature of the peas and their environment changed as respiration took place — it should rise. However, it is difficult to design a situation in which this can be easily achieved whilst providing a sealed atmosphere environment. Probably the best that could be done would be to place the peas, oxygen and temperature sensors inside an upturned vacuum flask over water. The external temperature would beed to be monitored too. Obviously some energy will be transferred through the water seal, but a rise in temperature of the peas and their environment over the external surroundings should be noticeable. An extension to the basic experiment could be to place the trough, beehive shelf, beakers, peas,etc into a thermostatically controlled heated water-bath, or on a hot-pate, and see if temperature affects the rate of respiration and so the speed of uptake of oxygen. Temperature up to around 40°C are OK.
A further investigation could be to see if light intensity has any effect, illuminating the peas with a light bulb and additionally recording the light level. One of the energy–saving fluorescent bulbs should be used so that little direct heating is caused. Readings should then be collected from the oxygen sensor connected to DrDAQ externally and from DrDAQ’s on-board light level sensor placed alongside.